I love hummus. I have a recipe for five minute hummus that I make in the food processor in, yep, five minutes, and I’ve made it so many times that my total hummus-making time is probably hours when you add it all up. Maybe days. But even though I have this perfectly wonderful hummus recipe, I can’t ever leave well enough alone. And so I bring you red pepper hummus. Which also takes about five minutes. Maybe six if you count fishing the red peppers out of the jar. Hooray for hummus! Right about now my mother is reading this and wondering if someone has hijacked her daughter’s blog, because red peppers are part of a long list of things I Don’t Like. Also included on this list are: mushrooms, eggplant and pretty much any kind of bean you can name. (Except jelly beans. I love jelly beans.) And cantaloupe and honeydew melon. As a result, my mom has tried various tricky things over the years to get me to eat some of these things and realize that I like them. I’m now wise to the fact that when she hands me something and says “Try this” and I say “What is it?” and she says “Just try it!” that it’s pretty much guaranteed to have eggplant somewhere in it. Or mushrooms. Or red peppers. So even I don’t know what possessed me to make a red pepper version of hummus, but I did, and I loved it. That’s right, Mom – I snuck red pepper into something all on my own! But this doesn’t give you free reign over slipping eggplant into stuff. Just so we are clear. I love you, but still no eggplant or mushrooms or beans. The other part of this story is that after whining like a nap-deprived toddler over the fact that I really don’t like my perfectly good $20 blender, the Southern husband finally couldn’t take it any more and showed up one day with a Vitamix. And ever since I’ve been blending anything and everything I can think of. Including red pepper hummus. 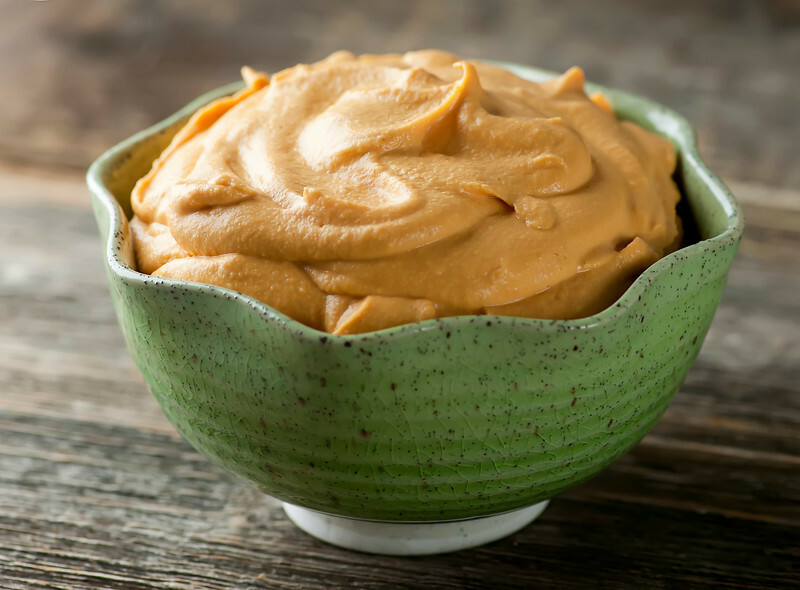 This recipe will also work perfectly well in your food processor, but since I was such a pain in the neck about the whole blender thing I am using the Vitamix for everything from hummus to soup to cake. Yup, I made a banana cake with it the other day. Stay tuned to this channel for that one. Back at the hummus, it’s perfectly wonderful just as it is, but if you sprinkle a little paprika on it…well, you are pretty much transported to red pepper hummus heaven. This concludes the very long and complicated saga behind this very quick and delicious recipe. Ladies and gentlemen, start your blenders! 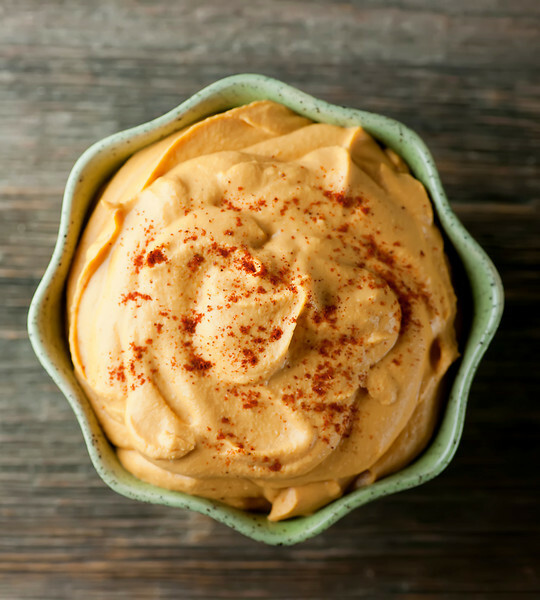 Put all ingredients except paprika in a blender or food processor and blend until smooth. Add a tablespoon or two of water if you like your hummus a little creamier. Blend again. Transfer to a serving bowl, sprinkle with paprika and serve! Ha! Crazier things have happened…you never know! You ARE aware that chickpeas are (garbanzo) beans, right? 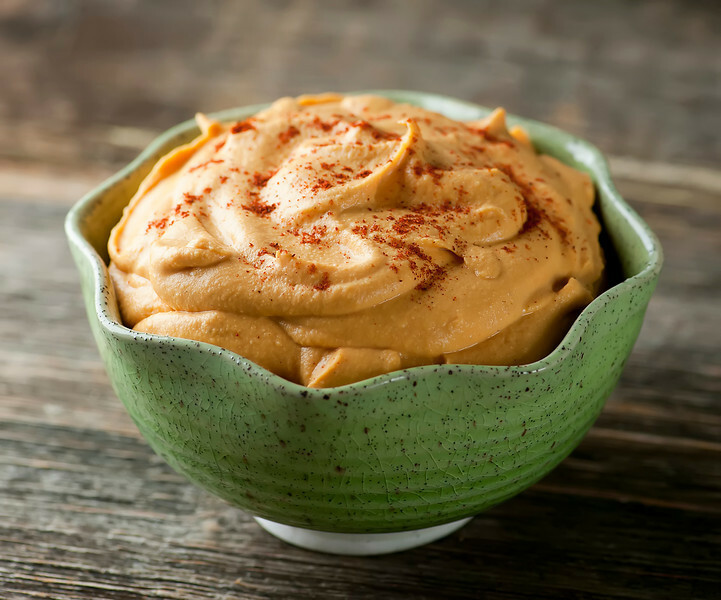 Cook’s Illustrated (May 2013) published a way to skin your chickpeas, thus making for a creamier hummus. 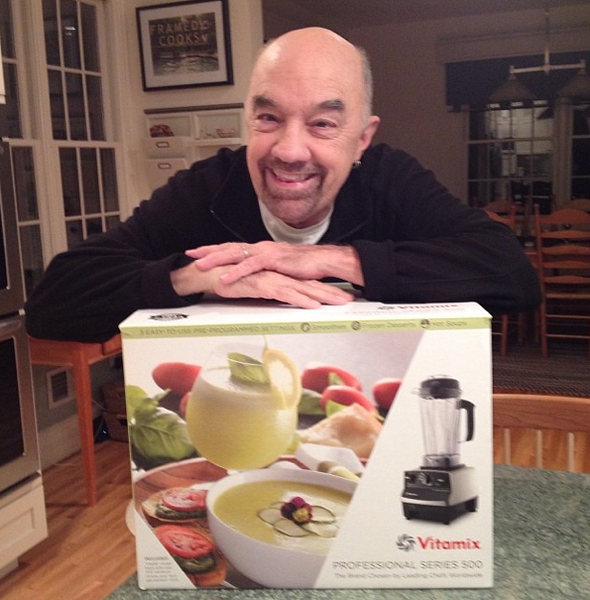 I hope you will start featuring Vitamix recipes in your blog. I realize that not everyone has a VM, but IMHO they should! Yes, I think I did know that and was blocking it out. :) Maybe I just need to pulverize beans before I eat them? And I’ll keep that VM idea in mind! I love red peppers. Thanks for this low fat version. I can’t wait to make it! My pleasure – hope you love it as much as I do! Kate, have you ever tried (or even thought of trying) Baba Ganoush? It is eggplant, but it’s roasted until it’s almost smokey, then it’s mixed with tahini and garlic and stuff. I bet that could get you at least to eat a little eggplant. Or caponata, that’s delish (has olives and capers and garlic and olive oil and other good stuff) and you won’t even know it’s eggplant. Kate, I don’t like fresh peppers, but I have found I do like roasted red peppers in a jar. I have been using your 5 minute hummus recipe for a while now and I added the red peppers in it and my husband loved it. Several of our grown kids loved it too. Thanks for the 5 minute recipe or I never would have liked hummus or red peppers.